Preheat the oven to 180°C/350°F. Roughly grate cheese using a box grater. Using a small, circular bowl, cut rounds from each slice of bread. In a frying pan, sauté bread rounds in butter over medium heat for approx. 1 - 2 min. per side until golden brown. In a separate frying pan, sauté bacon over medium-low heat without any oil until slightly brown and lightly curled. The bacon should not be too crispy, as it needs to be flexible to fit into the muffin tin. 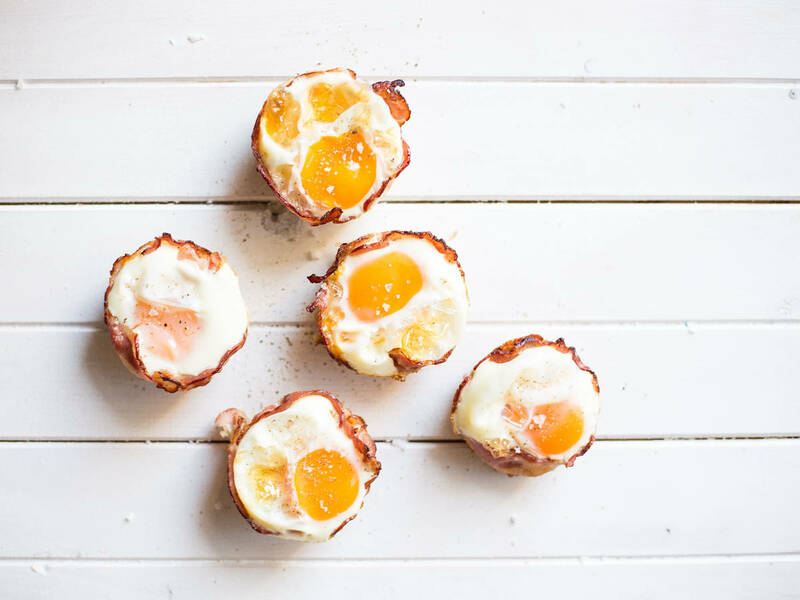 Place two strips of bacon in each muffin cup. Then, place bread on top of bacon and press gently so that it fits securely in the muffin cup. Evenly divide grated cheddar cheese among muffin cups. Next, crack one egg into each muffin cup. Bake in oven at 180°C/350°F for approx. 8 – 10 min. Enjoy!